The QuickSet is our best general purpose anchor, suitable for all conditions. The unique de-sign includes lateral fins that trip the anchor for faster setting. The cylindrical shaped flukes bury deep for greater holding power, and the fins stabilize the anchor preventing premature breakout. The shank is designed to smoothly enter a roller and the weighted ballast ensures that the anchor will self-launch. 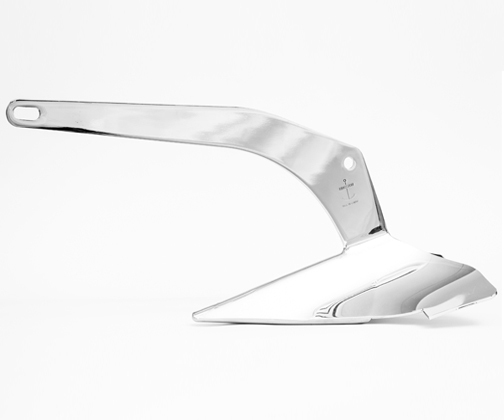 The anchor is made from 100% stainless steel to ensure long lasting anti-corrosion protection. We use all new marine grade stainless which means we do not buy remelts or substandard steel. All our steel comes with heat numbers and chemical analysis that ensures the best grade of steel manufactured for marine production. We believe our clients should know what they are getting and therefore we strive to maintain a durable and high quality stainless steel for our QuickSet anchors. Available in 14,22,35,50,70,88,100 and 140 Pound sizes.